An early Sunday morning wander (actually, a slow limp as I’ve hurt my back) through Aucklands CBD, Queen Street, featured a familiar face. Old Farmers Santa. 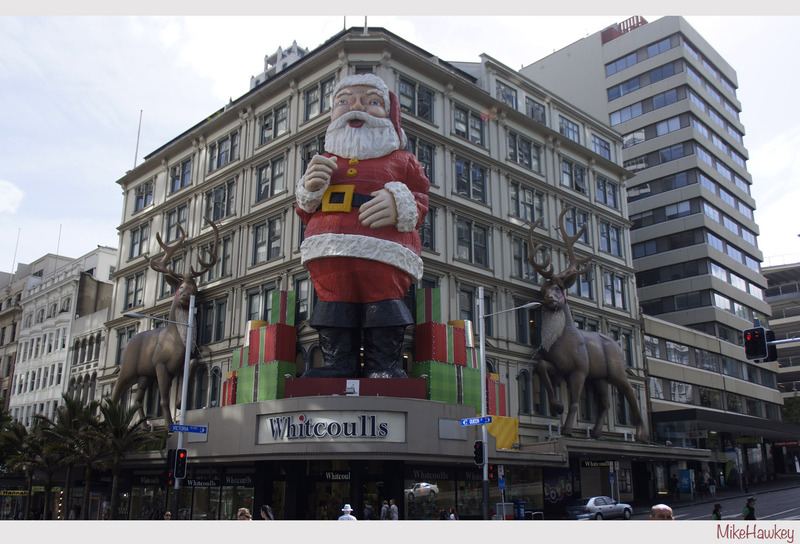 A bit of old iconic legend in Auckland, this 20metre tall, 4500+kg jolly man is now 53 years old! I recall his pre-facelift years where he had a summoning finger and winking eye – characteristics which brought about the title of being the worlds creepiest santa last decade (the size and design reminds me of Stay Puft from Ghostbusters) . Since his ‘facelift’ in 2009, his finger no longer moves, and his eyes stay wide open. A bit of a shame, but equally, probably for the best. I don’t recall the reindeer in earlier years. Imagine the warehouse needed to store this lot when christmas is over! What an amazing store display – if you weren’t in the spirit before, you sure would be seeing this Santa ! Merry Christmas! It sure is an impressive display to bring out each year! Merry Christmas!